Columbia, Mo. (March 20, 2017) — American adults are more confident than they should be about their ability to distinguish between real and fake news headlines. They also believe they’re much less likely than their friends to share fake news stories on social media, but when pressed, nearly six in 10 will admit they’ve probably shared such a story by accident. Those are some of the findings of a January 2017 survey commissioned by the Donald W. Reynolds Journalism Institute to coincide with a gathering this week in Washington, D.C., of journalists and former White House officials to discuss fact-checking, fake news and the future of political reporting. 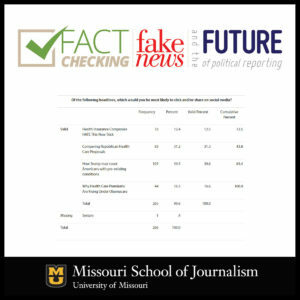 The 2017 Missouri-Hurley Symposium, “Fact-Checking, Fake News and the Future of Political Reporting,” was held March 9 at the National Press Club. The event was sponsored by the Missouri School of Journalism, RJI and the National Press Club Journalism Institute. Respondents reported a high degree of perceived competence in identifying fake news and clickbait on social media. Nearly two out of three of those surveyed indicated they had a 70 percent or more level of confidence in their ability to identify a fake news headline right away. Two out of five reported they were 100 percent confident they had never shared a fake news story on social media. In a fake-news quiz, participants were asked to identify the true headline out of a list of four headlines. Three of the headlines were fake (e.g., Denzel Washington Backs Trump in the Most Epic Way Possible). Less than half of participants (40 percent) were able to correctly identify a fake news headline in this survey, despite reporting that they could identify a fake news headline after taking a few moments to analyze it. Skepticism about the news media predicted levels of motivation to access the news. Results revealed that those who ranked high in skepticism about the news were also more highly motivated to access news, suggesting that higher levels of distrust in the news media were related to information seeking. Individuals who were more highly motivated to access the news were also more likely to identify a credible news headline as one they would be likely share on their own social media accounts. This suggests that individuals who are more distrustful of the news media and more highly motivated in news- and information-seeking may be less susceptible to sharing or believing fake news on social media. The proliferation of fake news leading up to the 2016 U.S. presidential election raised concern that this phenomenon may have altered the voting decisions of some individuals, in effect changing the outcome of the election. While the study confirms that social media are indeed a popular source for news (ranking second behind TV news), a recent study from Stanford University demonstrated that even the most widely circulated fake news stories were not seen by many Americans. The research indicated that the persuasion rate of fake news stories was not statistically high enough to convince Hillary Clinton supporters and nonvoters to vote for Donald Trump. This cross-sectional study questioned 266 adult U.S. residents in January 2017 using Amazon’s Mechanical Turk service: 148 male participants (55.6 percent) and 118 female participants (44.4 percent). As with similar online surveys of this sample size, the respondents are not scientifically representative of all American adults. The results and analysis are, therefore, suggestive rather than predictive.